Hello, hello, hello, boy time flies when we get older. This month has gone by faster than I can type its name. One of the things that I've noticed, not everyone has good house numbers on their homes. It might not seem to be a big thing, but if there is a need for the EMT'S to get to your home you want them there as soon as possible. Soooo, for your own well being see if you can read your numbers from the street easily. Now don't paint the number over the whole front, only kidding. Another thought would be if at night to turn on the outside light. You know another thing to think about is at night when you get up to make that little trip to the little room, to take a little peek outside to see if there is anything going on that shouldn't be going on. If there is someone looking back at you, SCREAM BIG, run as fast as you can past the little room because you won't need the little room anymore, you need the telephone so you can dial that little number 911. Another great benefit we have living in this life style is we have others looking out for us and with that in mind, we need to look out for others. See, that's what's so nice working around here you have someone watching if something happens, like getting grabbed by one of our gators. Those watching can always point where the big splash was (only kidding again). Make plans for the hurricanes so if they should come, you won't be left at the last moment trying to think what to do. We have the list of things you should have on hand if they should come like they did last year. Well, it's time to stop. Thank God. See you around the community. THANKS TO SOPHIE KAHLE AND EVELYN HEINFELD, WE NOW HAVE "SUMMER BINGO" AT THE CLUBHOUSE EVERY MONDAY NIGHT BEGINNING AT 6:30 P.M.. ALL YOU NEED IS A PACK OF BINGO SHEETS, (WHICH YOU CAN PURCHASE AT WALMART), YOUR DABBER AND SOME QUARTERS. COME JOIN US, HAVE SOME FUN AND SOME DESSERT TOO. The first of several summer "Upper Deck" Cocktail parties will be on Sunday, June 12th at 4:00 P.M. BYO and a snack to share. Join in the fun and games at the pool and then on to the "Upper Deck" for snacks and music. See ya there! For more information, contact Judy Laqualia at 728-4469. Residents and non-residents are invited to attend the Senior Luncheon on the second and fourth Wednesdays of June (June 8th and June 22nd). The City provides coffee and the main entrée. Bring a side dish of your choice to serve six people. Social time starts at 11:00 A.M. Sometimes there is a FREE bingo that starts at 11:30 A.M. followed by lunch at noon. Bingo continues from 1 to 2 P.M. Prizes will be awarded to all winners. Come and enjoy a fun-filled program. Call Chris Craine, Recreation Director, or Rebecca at 360-6734, if you need more information. We are finishing our first full winter season (Oct.- May) at Lakeside Terrace. 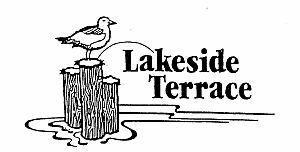 Last summer in Southgate and Coldwater, Michigan, we told family and friends all about Lakeside Terrace. We let them read monthly issues of "Seagull Soundings". We showed snap shots and told of friends and neighbors. This winter family (2) and friends (12) visited to see for themselves. Luckily for us not all at once! They were shocked, 200 plus homes and it's so quiet and country like, clean and organized. They were amazed by the people here - so nice and friendly. They all agreed we had found a Paradise at Lakeside Terrace. Please don't change while we are gone for the summer! Wishing you all a safe, calm, quiet, healthy and happy summer." P.S. See you in October. FYI: HAROLD AND CHARLOTTE SPENCE WANTED YOU TO KNOW THAT THE MONDAY CRIBBAGE WILL RESUME IN NOVEMBER AS WILL THE BEAN BAG BASEBALL AND HORSE RACES. The Good Sams Club would appreciate your cooperation when we have refreshments to prepare for memorial service and/or fellowship. As soon as we have the information, a notice announcing the arrangements for services, fellowship and refreshments will be posted in the Clubhouse on the bulletin board. Please use the sign up sheets. We must know the number of people who plan to attend said function. We can then be prepared to make the fellowship memory more comfortable for the bereaved. TO OUR NEIGHBORS WHO WERE ILL OR HOSPITALIZED RECENTLY, WE WISH FOR YOU ALL BETTER DAYS AND HEALING TOO COMBINED WITH GOOD CHEER AND STRENGTH. IN MAY, GET WELL AND THINKING OF YOU CARDS WERE SENT TO JOY HAHN, GEORGE DAVIDSON, ADENA NIELSEN, WALT KARWASINSKI, JOE HURLEY AND WALLY VOELKER. Also, our good wishes go out to our Sunshine Lady, Michele Lennon. We hope the plans for her knee surgery run smoothly and without further delays and complications. Good Luck Michele! I would like to thank all the residents who remembered me with cards, visits, etc. during my stay in the hospital and the skilled nursing facility. It's a real humbling experience being there and not being able to be self-sufficient. I plan on being home by the time this noted is delivered. I look forward to whizzing around the park on my new electric wheelchair. Things are quiet here now and our temperatures are cranking up now so more time is being spent at the pool. Hope all of you are enjoying the springtime wherever you are. A Memorial Day picnic is being planned for the 29th. Pictures will be put on the website (lakesideterrace.net) when Rich & Peg Aniol get back from their trip north. 8:30-9:30? From Oct 1st to April 23rd (1) we served 17 times; (2) had 337 people; (3) those 337 people ate 38 dozen donuts-456 donuts; (4) had expenses of $194.68; (5) had income of280.07; (5) had profit to Social Club of $85.39. Thank you for your support and we look forward to seeing you in the Fall. Again, volunteers are needed to keep this going. Next month a Bingo Report will be published. Hot tub: We are in daily contact with Chet on the status of the hot tub. Progress = albeit small has been made - Chet spoke with the rep today (5/24) and the paperwork will be submitted to Lake County in person - which hopefully will speed up the county process. Unfortunately we (the managers and the residents) are at the mercy of the company who was contracted to do the work. We realize that this has taken an inordinate amount of time but we do appreciate your patience and ask that you be patient a little bit longer. Please check the Manager's Board in the clubhouse for updates. Reminders: (1) Please lock the gates at the swimming pool when you leave if the pool area is unoccupied. (2) Clips are needed at your door so we have a place to put your Seagull and other flyers. Clubhouse Repairs: The materials are in and the work is being completed this week. Hurricane season is upon us! Most of us have been through at least one hurricane but it never hurts to review what steps we need to take in the event a hurricane is forecast for our area. This is in no means meant to frighten you but we should all be prepared in the event a hurricane does visit Central Florida this year. Prepare a Disaster Supply Kit or Evacuation Kit: No matter where you ride out the storm, a disaster supply kit/evacuation kit is useful. ~ Food/Water Items: Water containers - plan for at least 1 gallon per person per day. Non-perishible food and snacks for 1 week. Manual can opener, utility knife, cooler. work without power). Cell phone & charger. Weather radio. rain gear and work clothes/gloves/shoes). ~ Health & Safety Items: Alarm clock (battery operated with extra batteries). butane lighter(s). First aid kit. Essential" medication, prescriptiosn & dosage info. Medic Alert, Medicare and insurance identification. Extra eyeglasses/contacts and prescription. Update vaccinations (particularly tetanus). Camera. Trash bags (large, heavy duty).
" 5-gallon bucket with lid & bleach (emergency toilet). ~ Documents: Deeds, titles, wills. Insurance policies (life, health, home, auto). Medical records/prescriptions. Identification (birth certificate, passport, etc.). Billing statements from each source (mortgages, loans, credit cards, etc.). Consider storing family photos with your documents and placing all important documents in air-tight and water-tight storage/freezer bags. Bring extra batteries for all equipment (radios, flashlights, hearing aids, wheelchairs, etc.). If you are asked to evacuate, you should do so without delay. Location of shelters can be found in the clubhouse. Please check with your neighbors to ensure that they have a way to get to a shelter. Pick up a copy of the brochure entitled "The Manufactured Home Storm Ready Project" provided by the Florida Department of Community Affairs and the Federation of Manufactured Home Owners of Florida, Inc. - there are copies on the bookcase next to the front door of the clubhouse. Also available for you to read and leave in the clubhouse is a booklet entitled "Family Disaster Planning Noteb.ook". Both of these have very good tips! If you are unable to get to the clubhouse and would like to see the brochure and/or disaster notebook, please let us know and we will make sure a copy is delivered to your home.